Explanation: How hazy is Jupiter's upper atmosphere? 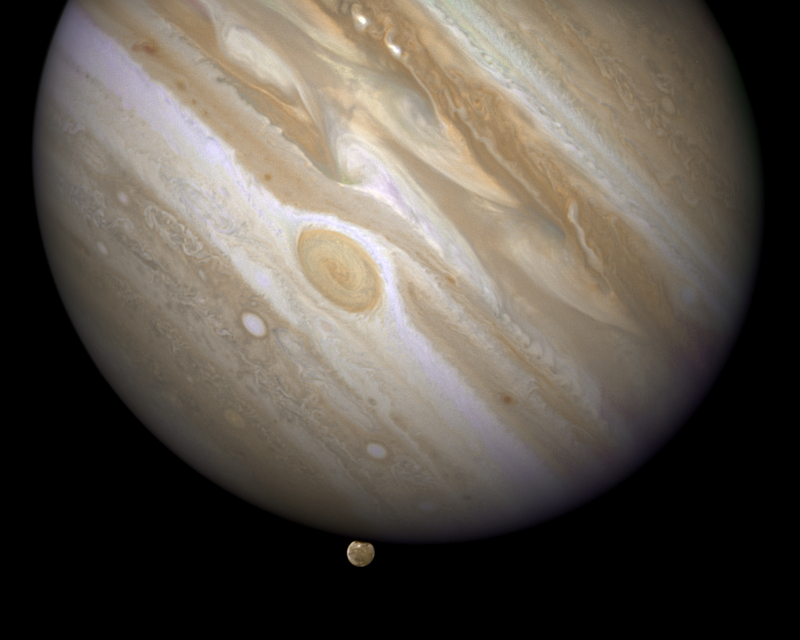 To help find out, astronomers deployed the Hubble Space Telescope to watch Jupiter eclipse its moon Ganymede. Although Ganymede circles Jupiter once a week, a particularly useful occultation occurs more rarely. Such an occultation was captured in great visual detail in April 2007. When near Jupiter's limb, Ganymede reflects sunlight though Jupiter's upper atmosphere, allowing astronomers to search for haze by noting a slight dimming at different colors. One result of this investigation was the above spectacular image, where bands of clouds that circle Jupiter are clearly visible, as well as magnificent swirling storm systems such as the Great Red Spot. Ganymede, at the image bottom, also shows noticeable detail on its dark icy surface. Since Jupiter and Ganymede are so bright, many eclipses can be seen right here on Earth with a small telescope.